EdgeProtect 4552 Enterprise Session Border Controller supporting 10 concurrent TLS sessions, up to 10 concurrent VoIP calls or 1 Mbps SIP video. 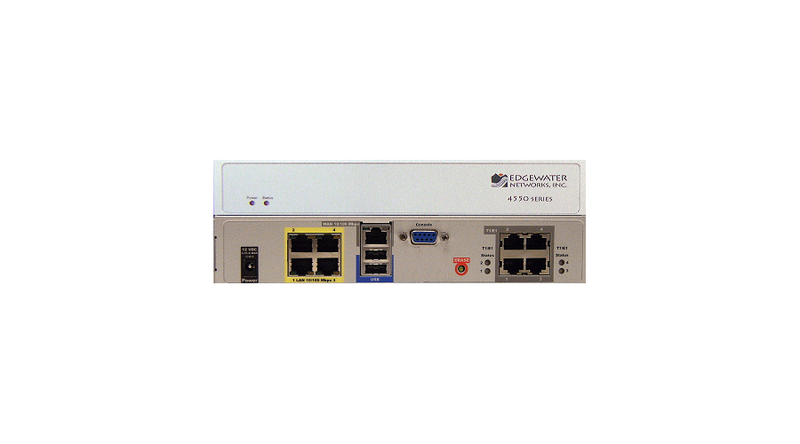 The EdgeMarc 4550 Series Enterprise Session Border Controllers all feature a 10/100Mbps Ethernet wide area networking (WAN) port and an integrated 4 x 10/100 managed VLAN switch. The EdgeMarc 4552 also provides up to 4 T1/E1 WAN ports with independent clocking that can be bonded for added scalability. Designed for SMB enterprise deployments, the 4550 Series supports up to 90 concurrent WAN VoIP calls.